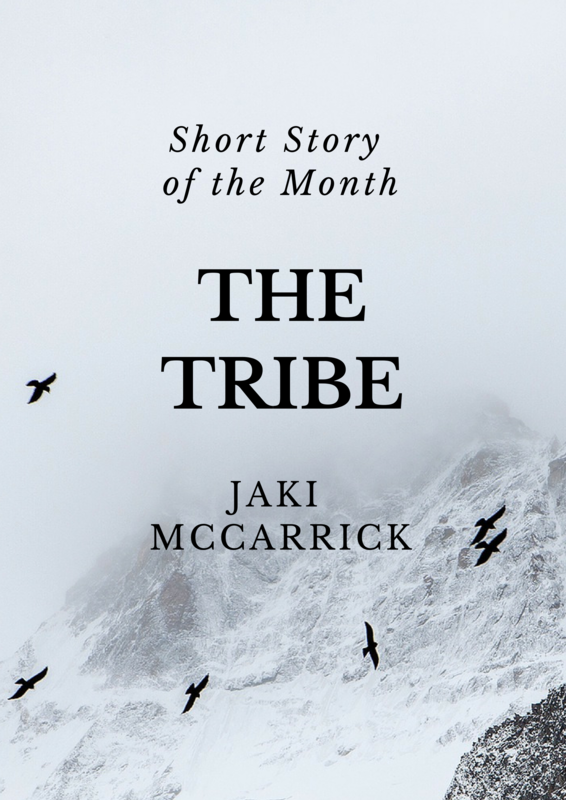 Our Short Story of the Month is ‘The Tribe’ by Jaki McCarrick, from her Edge Hill-shortlisted collection, The Scattering. The main character’s rationale in this story is unnerving and extreme – yet paralleled, bizarrely, in modern society with the ‘Voluntary Human Extinction Movement’. A stranger from another time trespasses in an ancient landscape, where a primitive tribe live their modest lives. He has a dark yet necessary mission – but will he manage to complete it? The American Dream has run out of gas.The car has stopped. The images that came up on the screen were of a cold, forested environment. Beside me the lake was iced over and wide as a sea. There were trees all around frozen ponds and up and down mountainsides. I wondered if there was human life here at all. Nothing stirred outside, except for the unmistakable shape of an owl flying across the almost-full moon. I wrapped up in my boots and Gore-Tex and kept my gun close. Into a compartment of my backpack I placed another, more lethal gun and clasped the bag to my front. I secured my mask and hood then exited the POD (shorthand for the small machine that had brought me here, with its state-of-the-art Personal Odyssey Drive® system). Outside, it was freezing. I’d never known cold like it. Not even on the coldest days in New York. In fact, it was not like any cold I’d ever experienced on the earth, anywhere (including the Northwest Territories where I had prepared for this trip).Yet it was so clean, so newly clean. I could distinctly smell pine, and the ice had a fragrant quality, close to mint. I knew that the tundra that covered the earth at this time had beneath it a multitude of flowers and plants, and it was as if the air now was full of the possibility of them. The season, of course, was spring. ​ I had begun to ascend the mountain when I saw what appeared to be a light. At first I thought my eyes were playing tricks on me. (I wasn’t hungry but I was tired and had considered returning to the POD, though it would have been dawn before I got there.) I thought perhaps the moon reflected off the snow, but the light was orange. Within a few steps I saw that a fire burned just beyond a redwood copse. (The snow on the trees’ laden branches made the copse seem like some outlandish installation, like those I’d seen years before in galleries in the Village.) My first instinct was to rush towards it. It had to signify human life – no animal as far as we knew had learned how to make fire. But what kind of beings had made this one? And what would they make of me? If they were the beings we sought, that I had hoped to find here, then could they speak? (We had presumed, perhaps conservatively, that I might encounter at best a protolanguage, and not, at this point, actual lexical structure.) I suddenly became afraid of what I might find, though I could feel the gun against my thigh, and it felt warm, as all security is warm, and that I was so quick to think of the weapons I’d brought with me gave me quite a jolt. ​ I gathered myself and tried to remember my purpose here. I checked that the vial was where I had packed it. It was. Cold and deadly as the modernity that had made it. I saw them sitting around the fire, their backs against a circle of high stones. Some of their young ran from caves and were followed by females who evidently disapproved of them out in the cold air. I could smell something roasting on the fire and saw within the flames a long slim-headed beast. Suddenly, the group rose to their feet.They began to make sounds out of the back of their throats which reverberated throughout the hills. The sounds seemed to pass from being to being in a perfect choreography of polyrhythms; it was quite like what I’d heard of Flamenco music. They were covered from head to toe in taupe, grey and dark-red furs, which looked to be the pelts of rabbits, some kind of arctic-like fox, and bears. The group sang its song to the fire, to the beast roasting on the spit, and to the moon and icy expanse – and though I could not understand a word (in so far as their song was composed of words), I felt, somehow, that this was a song of praise, perhaps, even, of welcoming the spring. ​ After a while, one of the older males loosened the beast from the two thin poles it hung from and set it down on a long flat slab. He cut furiously into it with a hand-axe made of what seemed in the moonlight to be quartz or river-flint. He made many piles of meat, and only when he gestured did the group gather around the slab to eat. They were talking. The sound was unmistakable: laughter, grunts, jesting, the aural characteristics of human engagement, all the sounds that one might hear in any modern crowd. These hominids were clearly enjoying their food. It was then I realised that other than the energy biscuits and apples in my backpack, I’d no further supplies until I returned to the POD. The POD itself had enough food for a few more days of my explorations here; the rest held in reserve for the journey home (if I would, indeed, return). I slowly unclasped the pack and squatted down beside it. I was so hungry I devoured two of the three biscuits and washed them down with a small bottle of chemical-tasting water. ​ Within a few minutes I could hear a commotion. I stood up and saw a fight break out between two males, between them, a young female clinging tightly to a rock.The smaller of the two males was eventually trounced by the other and stole off like a honey badger into the woods. The tall, rangier male brought the female towards two older females who laughed as they walked her back to the caves. Quickly, the peace returned. After the meal, the taller male quenched the fire and moved the stragglers along. There was something civilised and quite authoritative, I thought, about this creature hanging back to tidy up the remains of his tribe’s revels. ​ As I would need daylight in order to proceed with my task, I decided to remain where I was. Below me nothing stirred except three or four brindled dogs that looked like small wolves gathering in the centre of the valley to finish off the meat.There seemed also to be a constant rumbling sound, which I supposed was a distant ice storm (perhaps signifying some kind of metamorphic activity in the region). It was as I found an over-leaning bank of earth, under which I planned to sleep, that I heard the other sound. It was terrible and gurgling and instantly recognisable. I looked down and saw that the tall authoritative tribe-member stood in the empty valley below, a pole pierced through his chest, pinning him to the white earth. The others began to emerge from their caves and the sides of the valley. The young female and the group she had been with ran to him. They screamed and cried and pulled the pole from the tall male, at which he dropped to the ground. I heard a sound, if not an actual word, repeated again and again by one of the older females. ‘Orvey! Orvey! Orvey!’ she seemed to cry, as she continually tried to wake him. And I knew, somewhere in the depths of my being, that the sound – for how could I call it a word when I was yet to be convinced that this tribe was in possession of what could feasibly be called language? – meant: child. My sleep had been fitful. My dreams full of images from my past: old friends, many already dead, the bustle of the city (before the Hudson disaster), nights at the theatre, candlelit dinners. All of it punctuated by the repeating image of the male skewered to the ice. I had reached for my gun a dozen times, and held my backpack close throughout the night. I deduced that what had seemed, at first, to be a harmonious scene from where I was perched had probably been some sort of projection of mine. Perhaps I had wanted to be surprised by the life I’d found here; had imagined I’d stumbled onto an icy Eden of sorts. But the night had ended as it does in any town or city in any country in the modern world, where, in my time, the murder of a man over nothing more than a piece of meat was a pretty common occurrence. I don’t know why I was so surprised or saddened.What did I care about this group – with their backs to their high protective stones? I had not come here to care – not about this tribe anyway. Still, I could not get the older female’s cry, or the younger female’s attempts to shake the male alive, out of my mind. The sounds and images of the night weighed against any kind of meaningful sleep. These, together with the thought that nagged at the back of my mind, that the heavy-set, wilder male, who was probably the cause of the tall male’s death, had not emerged onto the scene – and was now, no doubt, loose somewhere in the woods, which, in the dawn light, seemed to me to be comprised of a variety of pines, oak, hazel and pistachio. I unscrewed the lid of my coffee flask and, though the remains were cold, I drank the liquid down. As I now had the day, and therefore the requisite presence of UV, I decided that this was as good a time as any: I would open the vial, release its contents then immediately return to the POD, hopefully without being intercepted by any member of this group, or others, though it hardly mattered, I reasoned, if I was. All the years of planning, the years put into the invention of and enactments with the POD, the meetings with world experts, all our predictions and conclusions on the modern world’s predicament – that humankind had brought its own planet to the brink of destruction – would culminate in this single act. (One release and it was done. The earth would be free of us. There would be no ‘man’. These early Homo sapiens would be wiped out.Whatever had brought about their leap in evolution, most likely the receding of the ice, would never again matter to archaeologists because there would be no archaeologists, no humans, no such concept, even, as evolution as consciousness itself would not exist.) I readied myself. The sun rose magnificently. A hawk-like bird flew overhead. I had observed it come and go a few times and presumed it came for the remains of the meat in the valley. It was in tracing the bird’s slow circular path that I noticed the intense brightness of the sky. It had so little sea to reflect off that it was as white as the ice beneath it, and the pale light dazzled my eyes. All the summits were the same giddying white, barely discernable from the vast opalescence above, except that here and there were thin lines of green, which were the trees. The winds had eased by morning, and the air was again full of the sweet minty smell. In this new light I could see also that horses ran wild from one end of a further-off valley to the other. A small, thickset species, mostly piebald, a couple of tans. But nothing else stirred in the valley of the tribe.The tall male’s body had been removed, and I could not help but wonder what way the group would mark this, if at all. I cleared up my things. As I made a crude attempt to clean my teeth in the new snow, I saw a female walking with a couple of pitchers – adapted from gourds of some description – in my direction. I quickly leaned in against the bank of cold earth. She climbed only a short way up then was gone from view. I heard splash sounds. I edged closer, not far from where she was, just a ledge or two above her on the mountainside, and the thunderous sound I’d heard the night before, that I’d supposed was a nearby ice storm, was, I realised now, a river, a waterfall, white and heavy with ice. As the female left the gushing river, I heard activity once more in the valley. I looked down and saw a crowd gathering. One of the group’s elders led a small dappled-grey horse, tethered to what appeared to be a rope made from plaited grass. He brought the horse to the cave where the females had interred the tall male’s body. Two males carried the corpse, placed it across the horse and fastened it to the horse’s belly with more of the grassy rope.The elder yanked the horse and slowly walked it in the direction of a lower valley, and the small crowd followed as if in a funeral procession. Well, it was a funeral procession. What had I expected? We knew that many ages of hominids had held funerals of sorts; but this was so easy to recognise, so close to my own experience of funerals, i.e. following the dead to some place of rest, that, again, I found myself quite stirred by this group. Just as I watched the last of them leave their circle of caves and stones (the female who had drawn the water, children with dogs), intending then to turn to the vial, I heard something rustle behind me. I did not have time to see what thing or beast it was, for a jagged, coruscating piece of quartz flashed slantwards across my eyes. I felt the warm trickle of blood fall to my tongue and everything went black. When I awoke I saw that I was inside a cave. The ceiling and walls were lined with leaves, straw and wood. In the gaps I could see a thick mud, a kind of adobe. Skins of various animals hung from the walls, together with an assortment of gourds (some of which seemed to be dyed or painted), and many bunches of pungent herbs and dried flowers. I could hear a fire crackling, the slow patter of the snow. I moved my head towards my body and saw that I lay on a bed of pelts – bear, goat, fox. Across me was a large fur – soft – perhaps from a big cat or bear. I went to put my hand to my face and saw that both my wrists were tied to pieces of flint impaled into the ground. I raised my head and saw the flickers of a fire at the place I had seen the beast roasting. ​ I was naked under the furs. Some ointment with a herby, sage smell was on my forehead and eye. I reeked of it. As the fire outside spasmodically lit up the cave, I saw to my right a stone mortar where I supposed the herby ointment had been prepared. I suddenly thought of my backpack. I looked around as much as I was able but could not see it. I began to fret. Over and over the same thought: what if someone, one of these beings, had opened the bag and found the vial. Of course, it occurred to me then that if that were the case my work here would be done: the virus would be released and within forty- eight hours this tribe and I, and eventually all the tribes of the earth, would perish (though the plants and animals would survive). This was all well and good except that I had not yet fully decided upon certain things – whether to return if I could, how to release the virus exactly, and when. So that the disappearance of the bag and the vial now did not at all strike me as convenient. I began to panic. I felt shame. Shame that they would intercept such a poison, and not when I intended. And that I should feel such things now also began to trouble me. ​ I seemed to be raving, could feel myself flailing about. I saw shadows move inside the cave and huddled figures gather at the mouth of the entrance. Something rustled constantly inside. It sounded at times like the fluttering of wings. And once, I thought I saw the shadow of a winged demon on the wall. Time seemed to converge into one interminable sweat. I awoke and slept, awoke and slept. One night I heard birdsong – a full and haunting sound. It caused a momentary break in my fever as I was suddenly brought back to a happier, more certain time. I recognised the song from recordings I’d once listened to, for this species of bird had been wiped out long before my time: it was the strange and splenitive song of nightingales. A cool hand pressed down on my forehead, a cold, wet cloth placed on my neck. I looked up and saw the young female the taller of the two males had been trying to protect that first night. She went to the mortar, crushed and pounded herbs with a pebble; she mixed the powder with water and warmed it with her breath. After spreading the mixture on my forehead, she lifted my head and squeezed a liquid from a sponge into my mouth. It tasted sweet; like a diluted honey or sap. I saw that her limbs were long and sallow, her hair dark and plaited, her eyes, green. I dozed slowly off to sleep and had no thought of the whereabouts of my backpack or the vial. For some inexplicable reason I thought only of my mother. What seemed like a few hours later, though it may have been days or even weeks, I was awakened by the creature. I could hear its light, erratic walk across stones and implements within the cave. When it squawked and flapped its wings I was relieved, glad at least that it wasn’t a wolf or worse. It was tawny with some white through its chest, and stared with pewter-coloured eyes straight at me. It seemed tame enough. The female who had nursed me sat in a corner huddled up under fur. She had fallen asleep, and not even the loud cry of the bird had woken her. It was then I saw my clothes – my jacket and trousers, on top of which seemed to rest my gun, lying up against where she slept. I wondered where the other gun had gone, and hoped it was still inside the backpack – wherever that was. I struggled against the two shards of flint fixing my arms to the earth. I felt stronger than the previous time I’d awoken and, bending my neck towards my right wrist, bit myself free and untangled my other bind – which was a mixture of wool and grass, and very tough. It was freezing outside the furs and my thoughts raced. I crept to the pile of my things. My neck and shoulders ached, though there was a numbness in the upper-left part of my torso, which, I deduced, was as a result of the herbs the female had applied. In two or three swift movements I retrieved the pile without waking her. I quietly dragged on my shirt and trousers. I found my boots close to the furs where I’d lain and put these on. Finally, as I went to put on my jacket, the bird, which I saw now was a hawk by its size and imperial poise, flew to the corner where the female slept. It rested on her shoulder and eyed me. Suddenly, the female dived out of the corner and I was thrown back. She pointed a long (and rather sharp- looking) piece of rock straight at me. She indicated to sit back on the bed, which I did, then picked up the one thing I had not yet taken up from the furs. I whispered, forcefully: ‘please, no!’ She laughed and, seeing my alarm at the sight of the gun in her hand, passed it from one hand to the other then tried to goad me by swinging it close to my face. I repeated: ‘please, please, no.’ I immediately saw that she was not young but an adult of perhaps twenty or twenty-five years. I kept my silence and made no further attempt to leave. Evidently puzzled by my new calm, she thrust the gun onto me and sat back. I was shocked, though damned glad, too, that the gun had not fired in the ruckus. I soon saw why: somehow the barrel and nose had been beaten down, rendering the piece useless. My heart sank as I realised I was now among these beings without a weapon (at least until I could find my bag). I tucked the battered gun into my pocket. As I zipped up my jacket the female gasped, evidently transfixed by the two pieces of fabric becoming conjoined. She came towards me but I pushed her aside, not wanting to leave the cave gunless and with a broken zip (and so risk dying of the cold). I shooed her as if she were a small animal and she backed off into her furs, afraid. With enormous effort, I got to the mouth of the cave, moved aside the large pelt that covered it. The moon was pear-coloured and full, the sky clear and immense with stars. I felt my head swoon. A new, stronger sweat broke, and I felt as hollow as the gourds that hung from the ceiling and walls of the cave. Then a sudden coil of hunger in my lower legs, and I fell over, weakly, back onto the bed of furs. At first she fed me with crushed pistachios and a kind of sweet date. Later, she gave me flat, unleavened bread made from a cereal, perhaps wild wheat. As I gained strength there was meat – bitter, rough, gamey. As soon as I could move she bade me sit outside my dark asylum each day to take in the light and air. From here I would watch the tribe. Often I would see groups of males return with dead beasts; usually deer, boar, a bear once, two seals. And I remembered that the wide lake, huge as a sea, was not far away, maybe nine or ten miles east. I kept the backpack and the vial to the fore of my mind. That I and the others were still alive was a sign at least that the vial had not been found and tampered with, and was probably under several inches of snow somewhere. But where? Sitting outside the cave, as weak as I was I quickly came to consider that perhaps we, my peers and I, had been wrong in our studies of these early Homo sapiens.They were as graceful as any man or woman I knew. Their facial bone-structure was wider than my own, and though the terrain I had arrived in was an ice-mass which, by my time, would become the hot and arid Middle East, they resembled, especially around the eyes, Inuits, or some tribe from the North, from Lapland perhaps. There were times I would look out at this tribe of snow-dwellers and consider that I was among a tribe very close in ways and appearance to my own. As they would pass, the tribes-people would acknowledge me, as if they were aware of how I’d come to be there. I did not see again the short, thickset male I’d seen fight with the tall male who, I now believed, had been my nurse’s brother, though I could not be sure of this. (It was just that the older female who’d cried that first night seemed to be my nurse’s mother by her absolute likeness and attention to me.) She (the older female) would work close by me as I sat snug in my bearskin outside the cave (usually scanning the sky for birds and wondering about migratory patterns), keeping her eyes on me like a sentinel as her quick hands skinned some animal, the entrails of which would gush a carmine-coloured river across the white snow. There were many females in the area of the valley in which I was domiciled, including my nurse, (though the males kept close account of my convalesence). Each day the women would comb down pelts, and from these make clothes and the caves’ furnishings. ​ I was taken one day from my study of the sky above the valley when the younger female pressed firmly on my shoulder, as if urgently seeking my attention. One of the elders stood beside her, his face markedly wizened. He stared down at me with bright, suspicious eyes. He touched my head, examined the healing gash. I did not react or resist for I was well aware of my weakness, that my limbs were heavy and thin. The elder pulled my head from side to side, and somehow I knew he meant me no harm. He turned to the female and spoke. It was some miracle of language*, as fluent as my own. We had supposed language the last of the major transitions towards modern man, and here it was, passing between these two primitive beings, perfectly musical and structured. It was as far as could be from the sound of apes and chimps (with their unorganised squeals and cries), and was rich and detailed, rather like the sound of Korean or Japanese with similar drawls and drags and, to my English- attuned ear, had irregular silences. It seemed to be a language that was rarely resorted to (each time I would hear them speak it I would be thrown by its strangeness and would be reminded of something William Burroughs had once said, that ‘language is a virus from outer space’). For it was as if this tribe preferred physical action, as I myself had witnessed here. But this was different. The female and elder were trying to explain something to each other and, I realised, to me. (I could not help but feel sad that whatever language they spoke, it was lost now to my world, like an unheard symphony or story.) ‘Mayga,’ the elder said to me, over and over, while pointing to my gashed skull. He walked in front of me carrying a stick, and stabbed it into the snow. He drew a circle, and within it an elementary map of the valley. Outside the circle he drew a shape, as common in my world as a symbol of evil and danger as it seemed to be in his. It was the body of a man with a maze of horns – antlers – on his head. He went from my head to the figure in the snow. His message was clear: someone was outside the tribe, and this someone had gashed my head open. Quite likely the squat figure I had seen kill the tall male that first night. * = In the late twentieth century the Nicaraguan government established the country’s first drive to educate the deaf. A school was set up, and within a short time, over 400 deaf children were in attendance. However, the government could not afford to staff the school with trained sign-language teachers, so, instead of conventional signing the children were taught rudimentary Spanish, lip-reading and more everyday gestures such as finger-spelling and counting. Needless to say, the program was not a success. Though, within a few years an amazing thing happened.The children, left to communicate with each other, had begun to develop a sort of pidgin language (sign and vocal).Whatever they had learned from their teachers they would build on, developing their own combinations and permutations of the signs and words they had been taught.The teachers also observed that the younger children in particular absorbed the new pidgin so that it began to spread amongst this group (essentially, a controlled group) like wildfire in a dry forest. Researchers were invited to observe. The Nicaraguan government was alerted and in a few years the school became something of a scientific sensation. For it had accidentally become a laboratory for the study of the origin of language. An area of science, which, over the centuries, had caused endless debate, where no two scholars could agree and no theories were alike, to the extent that in 1866 the Linguistic Society of Paris thereafter banned debates on the subject, the effect of which set the solving of this mystery back hundreds of years. Research disseminated from the Nicaraguan Deaf School ‘experiment’ suggested to later scholars that language had most likely developed among Homo sapiens who were ‘contained’, settled, where trust could be developed and words held real and consistent currency. This skill – as opposed to mere vocalisation (which had originated with Homo ergaster) and genetic propensity to language, suggested by the presence in more recent hominids of the Foxp2 gene, occurred, it seemed, only when humans lived as a tribe. Scholars concurred at last that language was the last aspect of ‘modern man’ to develop because it was the most mysterious: the inside of a person exposed completely to another in sound and expression, and for H. sapiens to do this at all, there would need to have been around them a degree of peacefulness and trust. Otherwise, hominids may well have had to do with an unorganised system of ape- like squeals, or, perhaps, even a strange kind of silence. The tribe I was now observing had clearly developed real lexical structure, which I could not understand per se, but, as the days went by, I could, if I tried hard enough, follow its subject- verb-object word order. Watching the tribe ‘speak’ in this way, I wanted to scream down the funnel of time, to tell my own world that they had not taken care of what had been so beautifully, perhaps even randomly, born, and that had early H. sapiens been more nomadic (as earlier hominids had been) may never even have happened. I began to gain weight and take walks to build up my strength, sometimes to the edge of the valley. This would also give me time to go over in my mind who I was and why I was here at all: I’d been elected to my task by my peers, the modern world’s leading scientists – ecologists, paleontologists, biologists, environmentalists. In the end, the premise for our decision (which we, as a group, had made unilaterally, without the consent of corporations and governments) had been simple. By 2320 the earth’s population had swelled to over thirty billion. Apart from polar regions, most rural areas had been urbanised. The world was dying from man’s relentless anthropocentricity, and our conclusion was that if the modern world must die then best it not be born at all. Extinction at this point of the tribe’s development would mean that a far lesser number of humans would perish, by some billions. (Because those billions would not have been born.) And with the combined invention of the virus* and the Personal Odyssey Drive® system, we had finally found a way to ensure the earth would survive. (Whereas, in my time, we were taking the earth with us.) The task had fallen to me to come back to the snow and ice from which mankind had emerged, to Qal’at Jarmo, on the edge of the Fertile Crescent, from where we had begun our journey towards the destroyed planet I’d left behind. In these very mountains, modern archaeologists had found advanced implements – sickles, cutters. The tribes at Jarmo were considered the first sustained settlements on earth. Around them other tribes would watch and develop. Our hope was that from Jarmo the virus would circulate as coldly and quickly as an ice stream, with eventual global impact. * = Developed in Milan University by a brilliant team who had arrived at an intense synthetic compression of the common cold virus, a virulent mutation with the power to rapidly corrupt the human immune system. The virus had been tested in freezing conditions, at around –40C, proving itself ideally resilient and fit for purpose. Had I doubts about the project? None. I had watched the most sophisticated societies on the modern earth implode. I’d visited extinguished cities as my forbears had visited Pompeii, walked their silent streets. (I’d seen the Hudson myself, the morning of the New Jersey chemical spill, had travelled by helicopter to see it from the air: a huge film of dead fish had covered the entire surface of the water so that it appeared like a vast bright Jello, stiff and unmoving.) As important animal species began to die out, it did not take my peers and I long to work out what would happen next: catastrophe, not just for humans but for the whole earth. And there was another, rather unpalatable, realisation: that we as a species were not unlike a virus ourselves in our modus operandi, one that could not conceive of its own toxicity. We believed we were divine, which was our trick; how we convinced ourselves to continue. In my age we had at last seen through to that trick. Therefore, throughout my trip I had been completely convinced of my task. I had seen the bee species die out from complex mites and plagues; observed with my own eyes the last of the Pine Island Glacier turn to meltwater. The world had not heeded the warnings of previous generations and was about to expire. I knew what needed to be done, and like some kind of Prometheus in reverse, I was prepared to do it. But I was a suicide bomber without a bomb: I needed to find the vial. I had begun to wish that I’d shaken the virus loose when I’d had the chance. If the earth was to have a future, I knew I had to do what I’d come to do, and soon: destroy this tribe and the tribes of the earth before Homo sapiens made their speedy and terrific leap forwards, which they were about to do. Soon, the tundra would leave much of the earth, now a great glacial plain. In a thousand years hence the New Stone Age would begin here and in Egypt. In less than four thousand years Mesopotamia would give rise to numerous towns and cities, Newgrange would welcome the winter solstice, Stonehenge would be erected and, soon after, the Pyramids would be built. Then the Chaldeans would map the skies. And all that came after would furiously devour the planet. Once I had cast the contents of the vial into the day, the earth would survive, though mankind would not. I had lost time. Those I had left behind in the world would see it continue its rapid descent into a new dark age, and they would wonder why I had not put an end to it all; why they could not close their eyes on the devastated world and wake as atoms and molecules in the morning. Now they would awaken as they had always done, my beloved mother, those friends of mine – good people, scientists, lab technicians, cleaners, actors, poets. It had become obvious to them and me that hope had died for human beings, that the most dignified thing we could do was let the earth have the earth and exit gracefully, and that it would have been better for the planet if modern man had not been born, had not developed at all. Yet here I was, weak and doubtful in an ancient valley; my days spent watching young birds make their first flights across the spring sky. I could, if I tried hard enough, forget that the modern world awaited its ending, its swift unbirthing. I could. But I would not. The air was milder than it had been, and across all the mountains I saw that the snow had melted in places. Patches of saffron-coloured gorse began to emerge across the hills. I called the younger female Dara. It sounded like the name I’d heard others in the valley call her. It seemed to suit her. Whenever I would wander away from the cave she would emerge from her own and watch me, her eyes beaming with pride in my growing strength. Once, catching me following the hawk’s lofty movements, I thought she might have seen something of my plans to leave the valley (one way or another). She called to the bird with pursed lips; a loud, shrill sound.The hawk was her own bird and answered her immediately, landing on her outstretched arm. She brought it to me. The bird’s speckled feathers heaved and vibrated as it beheld me with a familiarity that made me feel strange – as if I belonged here in some way. A short while after the day of the snow-drawing, Dara urged me to walk with her into the mountains. We climbed slowly. As the air thinned, my legs felt weak and we rested on top of a hill. Below us I could see tribe members hunting, some gathered wood or plants, and the valley seemed to me as busy as any modern town. I saw, too, that where upland fields had begun to thaw, wild grain grew in abundance. Also emmer and einkorn and a primitive kind of barley. Goats and their kids roamed freely around the summits, and I realised that these animals were not yet farmed – merely killed from time to time for meat, or occasionally milked. This tribe was just at the beginning of its farming genesis; they took only what they needed. They buried their dead, danced and sang, had a primitive kind of art – but had not yet been so numerous in number that they would turn to the earth and command it to feed them. This had not yet happened. And with the (dark) plans I had for this place, I was loath to assist them with any kind of encouragement or instruction in animal husbandry. Our happy excursions into the mountains did not, however, last. One late-spring morning, the hawk having left us for its own fun and privacy, we heard below us in the valley an explosion of cries. Dara clung to me and I dragged her, weak as I was, to the ground. I gestured to her to be quiet as I peered over the bank. A group of about twenty males with blue and ochre markings on their faces and pelts, wielding axes and what looked like spears made from sturdy lengths of pinewood, had made their way down the mountainside. At the helm was a familiar figure: the short squat male, adorned now in beads, and necklaces of bones and teeth. There were antlers on his head. He was the male I’d seen the night I’d first arrived, and clearly the figure from the snow-drawing and, I realised, probably the same male who had gashed my head open. He led his group of marauders into the valley. We watched as the snow below us turned all shades of crimson.The antlered male searched where the women were. He looked perhaps for me, perhaps for Dara, whom he had fought over that first night. Some of the males threw stones – violently – in all directions. Then Dara let out an aching, breathless cry, as a burst of long, speckled feathers floated on the air, and the body of her hawk fell to the valley floor with a low but devastating thud. Eventually, the invaders began to leave in the direction from which they came. I looked down to see nine or ten bodies lying scattered on the snow. I could feel Dara wriggle from my grasp and dart for the top of the ditch. When I pulled her down she began to cry and I urged her to be still. The floor of the ditch was soft and I saw that an oily, dark-red substance trickled underfoot. Even in the middle of all this mayhem, the environmentalist in me observed that the earth here was rich in fuel, and that this tribe had thankfully not yet learned to burn it. As I bent down to touch the resinous substance, I made my next extraordinary discovery: my backpack. I dragged it from its oily burrow and checked inside: the vial was still in the flask, and still inside its compartment was my gun – wet, but very much intact. As members of the tribe began to return to the valley, howls of grief, loss, confusion echoed throughout the hills. Such sounds might have hailed from any modern war-scene: women and men screaming, long confusing silences, inappropriate laughter from children and the mad. As we approached, we saw that Dara’s mother lay with the dead. Dara ran and flung herself down onto the bloody heap. More than ever, I could see the need to complete my mission here; our violent story had already begun. If there had ever been an Eden-like time on this earth, I was convinced it was not now and not here. Perhaps such a time had never existed on earth, at least not when hominids had been on it. It was clear that I needed to complete my task. I resolved to turn back and climb to the top of the mountain and release there the contents of the vial into the air. The day was bright and windy. The most perfect day on which to have found my backpack (and the vial). But I did not turn back. Dozens of bodies, blood, dead animals: I had brought this. A group of males gathered from the tribe; I heard them speak in their primitive singsong language and knew by its tempo (and the males’ physicality) that their anger was fierce, their intent equal to it. They split off into smaller groups and followed the last of the invaders. My standing amongst the tribe was different now. Old males and females bowed their heads; hunters met me with suspicion, as if I had somehow usurped their power. Dara sat sobbing with the hawk. Before dark, I walked her to her own cave. When she had fallen asleep, I took the bird and buried it up by the ditch with the harebells and wild violets and the melodious song of the nightingales for company. One night, when Dara was sleeping, I walked up to the place of the hawk, sat and thought, my backpack on my back. I had made up my mind that I could not complete my task, after all. I would go this night and return, if I was able, to my own time. This ancient tribe of mountain people, who were mainly peaceful, who had treated me with immense curiosity and suspicion – but also kindness – did not deserve exposure to the unearthly microbes in my flask. The more I related to them, the more contact I made, especially since encountering Dara (and all that had come with that), the more I could not complete my mission. I realised now that militant as I had been, I was the wrong choice. I found that I could not be blind to them. I saw them as my own, and every instinct inside me would not let me spill that vial. I sat on the edge of the bank and looked down at the valley, at the dark and sorrowful ice.The night was still, except for the low and constant rumble of the waterfall, the whinnying of horses in the valleys and mountains beyond. I made a quick inventory in my mind of what illicit glimpses into the future I had given them: I knew I had been reckless in what I had chosen to teach the tribe. (I was well aware that each lesson, however small, could inestimably change the course of history.) Yet I could not bear to watch them suffer while in a position to help. I’d shown them how to make pottery from clay and water and how to fire it (the gourds being so utterly useless); shown them, too, how to make wine from berries and brew coffee from seeds and beans. But perhaps most reckless of all was the weaponry-making I’d taught them. I knew there was evidence of the development of bows in Spain around the same time, and I held tightly to this fact so as to allay my guilt. The moon was yellow and full in the direction of the POD, and it cast a warm glow over the valley. I would miss this place. I made a mental note: if I did manage to make the return journey to my own ravaged world, I would, if I was able, come back one day to these very mountains and search for the valley. Dara: the thought of her troubled me. Even so, I turned from the quiet place of the hawk and began my descent. I was stronger than I had been in spring, though I had gained much fat on my stomach so that I must have appeared pot-bellied. As I descended, I noticed that the ground was much grassier than it had been, for further down the mountain the ice had begun to retreat. I was certain as I went on that I could smell something fragrant and familiar: roses. Possibly some early wild-rose strain. I knew paleontologists had believed the rose older than man, older than the dinosaur (having found evidence of the flower from the tertiary period). I stopped, briefly, to look for a rose or rosebush, as if the flower stood for something, the hardy, determined spirit of the earth, perhaps, but I could not trace the source of that perfume. There was a natural staircase of turf-banks and rocks, though occasionally I had to hang off the edge of a sheer bluff in order to descend. (When I had first climbed these mountains they had been thick with snow.) There were numerous night birds chattering and singing. I recognised the hooting of owls and remembered the sweep of that first owl across the moon when I arrived. I sensed I was close to the POD. The air was saltier, and there was a new sound in the air, a hypnotic to and fro, a familiar crash and fall: the unmistakable sound of waves. I felt a new hopefulness, an eagerness in every step. I realised how much I looked forward to seeing the modern brilliance of the POD, built by the men of my time. I felt my brain come alive, sharpen; the sleepy, fur-buried bliss of the valley begin to fall away like shed skin. I was both excited and sad, because I knew that the valley’s comfort and quiet had healed me and made me happy, yet I was also happy to leave it. Just as I saw the journey I had yet to make, I heard a scramble in the bushes behind me. I thought I was again under attack and reached for my bag. (Such was the sense of slumber in the valley these past months, I had forgotten to keep my gun close.) The bag fell to the ground and my assailant pounced, unzipped the bag and held me down, keeping the gun close to my mouth. From where she had found the strength to hold me down I do not know. Perhaps, it was that I was so weak, so much weaker than I’d been when I first came. The blow to my head all those months ago had been almost fatal. I had been impatient with my recovery, though realised now that it had probably been miraculous, due most likely to the herbs she had applied – plants about which we’d only folklore in my time (variations of burdock and cloudberry). Dara sat back in the Mesopotamian dark and held the gun out, as she had seen me do. Her hands shook, and I saw that her thick, long fingers were unable to grasp at the trigger. She knew I had come from very far; surely she suspected that one day I would want to return there. ‘I’m going home, Dara.’ I said. ‘Home.’ I pleaded with my eyes for her to understand. She laid the gun on the ground and kicked it towards me. I could see she was furious and did not want me to leave. But I had to return; if only to inform those who waited for me that I was not the man for the job. I could not destroy the tribes, not even to save the earth I loved so much; a mercenary with more resolve than me would have to be sent. And even then, I hoped such a man or woman would set the dials a little further on, so that this tribe could live out their years, so that Dara could live out hers. She stood up, and in the moonlight I saw she’d been crying. And once again in this ancient place, I felt shame. The kind of dark, twisted shame that is only felt by the people of my time. She gestured to the land around us, to the mountains, still cloaked in snow, as if to say, here was home. She took both my hands and laid them on her head, as if to say, here was home; she placed my hands and hers across her fat, protruding stomach, as if to say, here was home. ‘Orvey,’ she said quietly. (I had heard that word in the valley before, and knew very well what it meant.) I could not speak. I had never felt anything quite like it, this deep cloying certainty at the pit of my stomach. She was with child, and in an instant I felt as bound to them both as a flower is bound to its stem and root. We walked towards the beach. Here, much of the ice had melted, and though in my time this was a large saline lake, here it was a real sea – tidal, blue, endless.The water crashed against the rocks and low cliffs. Great sheets of ice were washed up and dashed back again, and were eventually liquefied by the tide. I turned into a wooded area before the low dunes. I saw the chrome and graphene shell of the POD shine out between the dark barks of the trees. I came upon the open space where I had landed. The POD looked magnificent. It had been a while since I had seen the beauty that modern man could create: we made these dazzling, miraculous machines, most of which we used in the business of killing. How had we imagined works at once so beautiful and cruel? Dara was curious; she crept around the machine not knowing what to make of it. I pressed my hand on the locking device and the door opened. I indicated to her to remain outside as I entered alone. Inside, all was as I had left it. A pristine homage to a world that was addicted to control, yet completely out of control. I laid down my backpack on the small fibreglass counter. I took out the flask with the vial and placed it in its lead container and locked it: without a key the container could only be opened by some kind of terrific blast (nuclear would do it). I looked around, wondering if there was anything I needed.There was nothing I needed. I exited and re-sealed the door. I leaned all my weight against it and pushed. About the size of a small wardrobe, the POD toppled over the bank and onto the sand with ease. From the beach, Dara and I pushed and rolled it over three, four times, like a huge heavy beach-ball, until it reached the water. She watched her reflection bending and doubling in the chrome as the POD turned over, and we laughed. The contents of the vial would remain inside the POD, possibly for eternity. I watched the machine float for a while as the tide took it further and further out to sea. At some point it would go under and find its way to the bottom, where, one day, thousands of years hence, Persian divers might wonder what strange aliens had come to visit these shores. Dara joined me at the edge of the water to watch the bright machine, now half a mile out, sink beneath the white surf. Eventually it slipped from view. I would never go back now. As the two of us ascended the mountain, I could no longer hear the waves, and the smell of salt was soon replaced by the sweet, minty scent of the pistachio trees. I thought of this tough dark-haired woman climbing beside me and of the child we would soon have. I decided then that I would tell our children to put their faith in the earth, but not to command it. To read it, work with it, share it. I promised my own age I would impart these things, and hoped as I walked with Dara into the mouth of the valley, the sea far behind us, that our children, and theirs, would remember.